Organizations everywhere are constantly working on new projects, and yours is no different! Email newsletters are a great way to spread the news to your supporters about all the new and exciting activities happening at your organization. Including regularly scheduled newsletters as a part of your engagement strategy is already an important first step for your organization. The problem that many nonprofits run into is ensuring people actually read these vital updates. When people are tuned into regular nonprofit email newsletters, that organization often experiences a boosted digital presence, more gifts donated, and growing attendance at fundraising events. Link to your donation platforms. Feature a calendar of upcoming events. Let’s dive into the first of these awesome email newsletter strategies! 1. Use Catchy subject Lines. When you look at your email inbox, what’s the first thing you see? The subject lines of your unopened emails. This is the first point of contact people have with your newsletter, so it is absolutely essential to put some time and effort into perfecting them. Once your reader has opened your email newsletter, they’ll see all of your important updates, email giving opportunities, and upcoming events, but we’ll get to that in a minute. First, focus on just getting them to open the email. Make sure it is the proper length. Guarantee readers can see all the words of your subject, so it’s not too long. Aim for about 17 to 24 characters or 3 to 5 words. Don’t use all caps. When you use all capital letters, your email is more likely to look like spam. Plus, all caps gives off the vibe that you are yelling at your reader and no one likes being yelled at. Include a number. Instead of writing out the number, use the numeral version to draw your reader’s eye to your content. For example, use “4” instead of writing out “four” in your subject. 2. Link to donation opportunities. Once people have clicked on your email to read the rest of your “story,” be sure they have the tools they need to react. The best reaction you could get from your readers is a donation. Why is this considered a reaction? Well, your newsletter updates your reader about all the amazing things your organization is doing. By sharing all this information, the hope is that your readers will be inspired them to participate. The most immediate way to participate: contributing a donation. Email donation buttons. Include a button right there in the email for people to click on and donate right away. This is by far the fastest and easiest way to include a donation option in an email newsletter. Online donation pages. Include a link to your online donation page so that people can send a donation through your website. This will also give them a chance to explore your site more after the donation is complete. Mobile giving platforms. Set up a text-to-give campaign and include the number to donate in your email newsletter. This appeals to your donors who keep their cell phone on them at all times. To read more about the different methods of donation and platforms to provide such opportunities check out Snowball’s guide on online donation platforms. 3. Include social media buttons. While your newsletter is a great way to update your readers about the big things your organization is achieving, social media is a great place for them to see the everyday actions of your organization. Use these two methods in tandem to keep the attention of your supporters. Social media is a great way to encourage future engagement between your readers and your organization, such as peer-to-peer fundraising opportunities. Include social media buttons on your email newsletter to make starting this engagement opportunity that much easier. Only include buttons to active social media accounts. Don’t lead your supporters to an account that is rarely used because it could hurt their engagement more than help it. Add the buttons in a place that won’t take away from the rest of your content such as the side or bottom of the email. Try adding it right next to your text-to-give number so that all your additional resources are in the same place. Make sure clicking on a button will open the social media site in a new tab as to not take people away from the newsletter. The same strategy can be taken when you link to donation pages or invitations to upcoming events to hold your reader’s attention as long as possible. Make sure to also add social media buttons to your donation pages. This gives people the chance to share the contribution they made to your organization. 4. Feature a calendar of upcoming events. One of the perfect additions to your email newsletter is a calendar of the upcoming events for your organization. A calendar gives a visual representation of your organization’s next opportunities for supporters to get involved. This visual representation not only cuts down on the text you need within the email, but it also makes it easy for your readers to plan out their own calendars. A visual monthly calendar page is an easy comparison tool for your readers and their own calendars. They can transfer all the information about the fun events you have planned from one calendar to another. It also cuts down on page flipping and month searching to make plans. Making it interactive. Enable features on your calendar so that people can click on the different events to get more information. It may lead them to your event Facebook page or include a fundraising thermometer for the funding status of an event. Color coding your activities. Try using different colors on the calendar for the fundraising events, holidays, special office celebrations, stewardship events, etc. Don’t forget to include a special color allocated to events that still need funding (and a link to the donation page for it). Link back to your main calendar. Many times organizations find it difficult to fit all the information they want to on one calendar. Linking the email calendar to the main one on your website give readers access to all your important information, plus, it drives online traffic to your nonprofit’s website. Your calendar is a perfect place to connect people to your fundraisers that are tied to events. For instance, sell event t-shirts online and include a link on the calendar to the page that you are selling from. 5. Recognize members or donors. Recognizing your donors or members is another great way to encourage the continued contributions of your supporters through your regular newsletter. Try emphasizing your recognition program in the time between two major fundraisers. This is a great way to encourage donations to your regular donation page as opposed to support for particular activities or events. Appeals to the competitive nature in those who want to be featured. Donors who see others featured on your page will want to be featured themselves, encouraging their continued engagement. Include a link to your donation page to make it easy for them to fulfill this goal. Shows your appreciation for support. A digital appreciation wall is a great way to show your donors you care. It celebrates the work of an individual, showing everyone that one person can make a big difference. Builds a legacy amongst supporters. If a donor is featured on the virtual donor recognition wall, they are more likely to read future emails to see who else will get featured. Or, they might look to be featured again! Either way, their legacy stands as a supporter. Feature supporters like the top donors for the month, the volunteers with the most hours, or random supporters who helped make a difference. For more information about how recognition walls work or how to feature them, check out Double the Donation’s donor recognition wall guide. 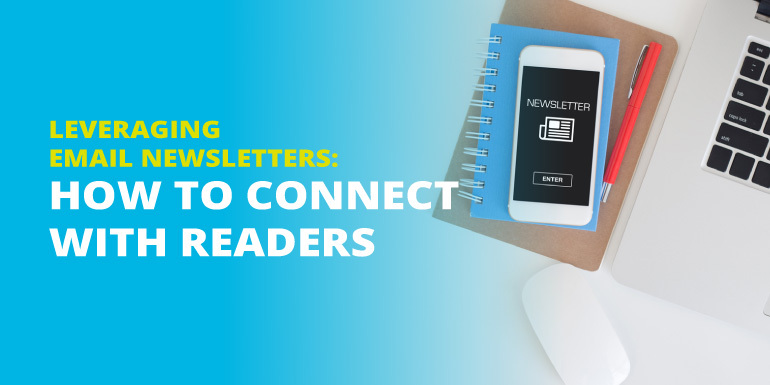 Connecting with your readership in a regular newsletter is a great way to encourage engagement with your organization as a whole. You can use email newsletters to see more people showing up to your events, more donations flowing through online channels, and a greater social media following. With these 5 strategies on hand, there’s nothing stopping your team from increasing online engagement and driving giving to your cause! Special thanks to John Killoran from Snowball Fundraising for expert advice on how to leverage email newsletters. About John: John Killoran is CEO of Snowball, an exciting new fundraising technology that makes it easy for people to donate in two clicks from text, email, web and social media sites. John pioneered SMTP payments and has been a major innovator in the mobile payments space for the past 5 years. When he is not running a company, he is cooking food for his family and telling his dogs to stop barking.